Several years ago, when I first found out I would be teaching Geometry, I’ll admit I was a little nervous. Why? Proofs. My last “geometry” class was in high school (I never took a class of only geometry in college). I knew that I could do proofs, but explaining them would be something totally different. I have formed my own way of how I like to introduce proofs. That’s what I’m going to share today. I’ll write another blog post later about how I actually teach lessons with proofs. Sometimes at the beginning of the year, I like to teach a lesson about Optical Illusions. I think it helps lay the groundwork for proofs quite well. 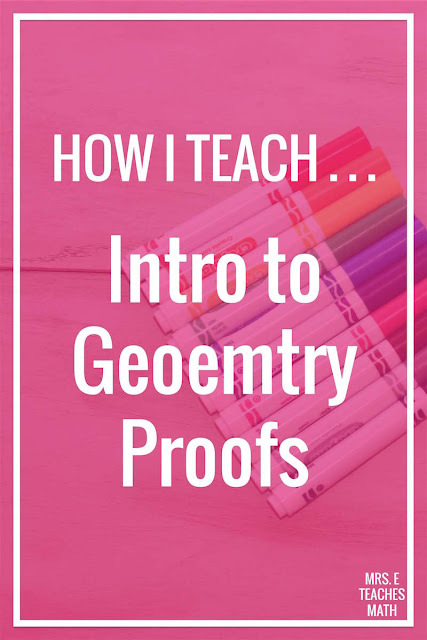 In my curriculum, there is an Introduction to Geometry unit and the next unit is Logic and Proofs. In the Logic and Proofs unit, I teach Conditional Statements, Biconditional Statements, Laws of Detachment and Syllogism, and the next lesson is Introduction to Proofs. I usually start class with this powerpoint. 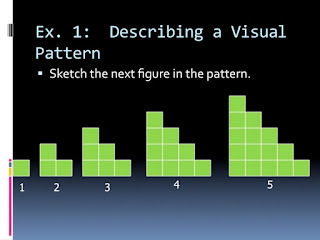 It’s a very short review, because my students have heard me using this vocabulary and talking about patterns before. 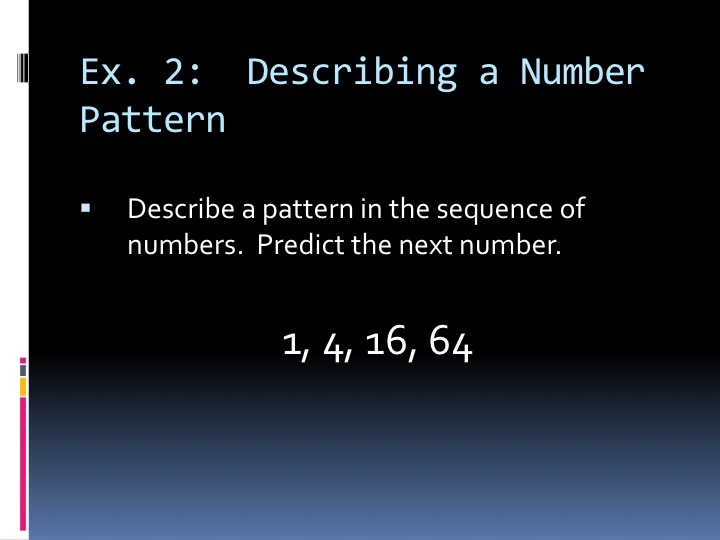 I try to stress looking for patterns and making conjectures no matter what lesson I’m teaching. Okay, so I’m going to tell you a story about what I did last night. I took a shower and changed clothes. Oh, but I went to the gym first. I burned the bread. My husband and I walked our dog, Zoey. My husband did not like it. I went to bed. Oh, I also cooked dinner for my husband and I. We watched Netflix together. Does that story make a lot of sense? Could I have told it better? This is the order that everything happened. I went to the gym. Then, my husband and I walked our dog, Zoey. I took a shower and changed clothes, then cooked dinner for my husband and I. I burned the bread and my husband did not like it. We watched Netflix together. Then, I went to bed. Is that story easier to understand? In math, we explain things the same way. No one likes to have things explained in a jumbled, confusing way. 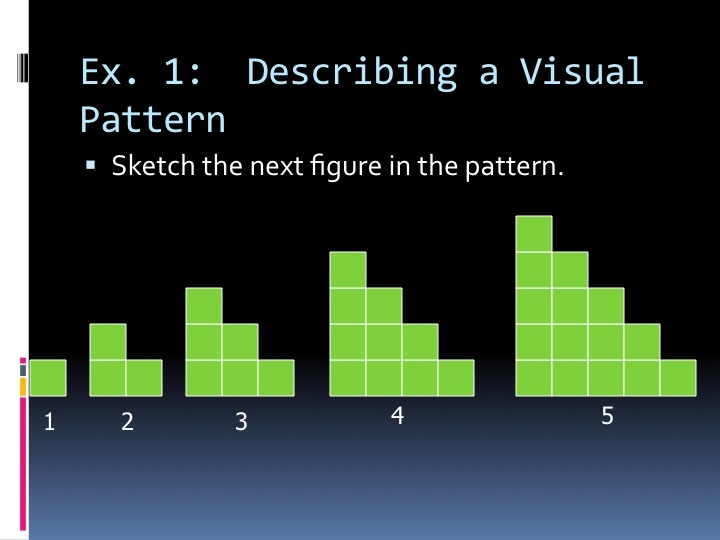 So, we explain our thinking in a logical order, the same way you would tell a story. Next, I give out this sheet for the students to practice ordering the story. They have probably done something like this a million times in English class in elementary or middle school, but I still think it’s good practice. I honestly have no idea where this worksheet came from (I’ve had it a long time). If you know who made it, let me know so I can give credit. I always let them work with partners on this worksheet. There are a few steps that they will argue over, which I like. Finally, I start talking about Algebraic Proofs. I don’t actually talk about the properties of equality until the next day. On this first day I usually just put a few equations on the board and we solve them. However, I also write “what we did” next to it (forming a baby two-column proof). Something as simple as “multiplied” or “subtracted” works for me on this first day. I typically don’t give homework on this night. The next day, their warmup is usually to tell me logically, what they did the night before. I’m looking for a short five or so sentences that make sense (logical and in order)! Stay tuned: In a few weeks, I’ll share how I actually teach lessons with proofs. I am teaching Geometry for my first year and am nervous about proofs. Was excited reading this, and saw that you were going to write in depth about how you teach proofs but cannot find where it is. Could you direct me to it as I would like as much insight as possible before teaching proofs. THANK YOU SO MUCH! Totally random... 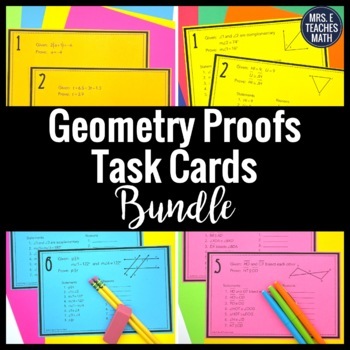 I am a writer by trade and needed to make an analogy using geometric proofs and came across your site. The illustration you gave (your jumbled up story)to introduce proofs was GREAT. 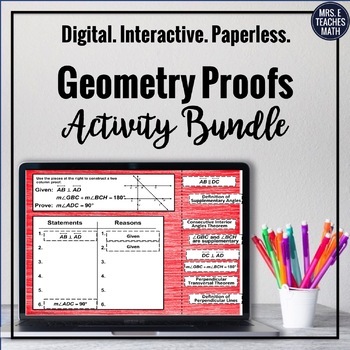 My daughter will be taking geometry before long, and I plan on visiting this site to brush up on those skills! Thanks for making it easier to understand. I'm glad you liked it! I hope it will be helpful for you in the future! I'll be following your site. I really don't know where to start. 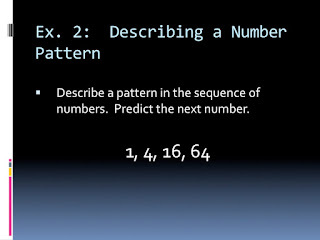 http://mathteachermambo.blogspot.com/p/downloadable-activities.html. You can find it under activities "proof story". I can't find the worksheet through the link. Please help :) Sounds like an awesome idea! It looks like the file has been re-arranged by the author (not me) a little bit. If you click the link "HERE", you will be taken to her box account. Then, you can choose "Geometry" and browse through the files until you see it. I saw it on page two. 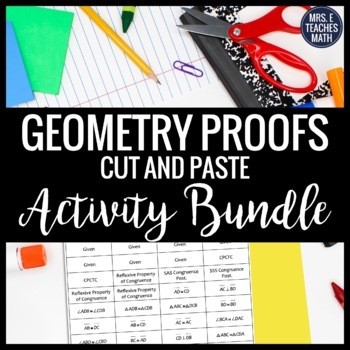 I'm a student but I must say our math teacher needs to read these posts to be able to explain proofs better. She just writes in and expects us to learn it as given.